Battles won, homes saved, mysteries revealed. Now things get really interesting! The best campaigns are living campaigns. Things are happening everywhere, and your character, no matter the level of power, is a vital part of any world-changing event. 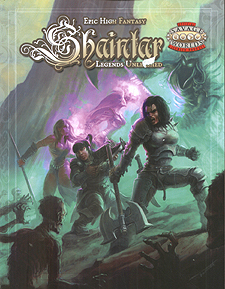 Great Game Masters have the knack to make this happen with any world, but Shaintar has that knack built in. The world hangs in a balance between Light and Dark, Devastation and Life, Heroism and Villany. The player knows that only by embracing the heroism can the player's characer tip the balance. "Shaintar is familiar enough to immerse yourself in, yet strange enough to make you want to know what new wonders are about to be unleashed. And now the wonders are loosed. Fasten your saddle cinch; it's going to be quite a ride." - Steve Perrin, legendary writer and creater of the RPGs Runequest, Worlds of Wonder, Elfquest and much more.